Have you ever heard those radio commercials making fun of the family with no emergency plan? Me too. I keep thinking that I (we) should have such a plan, and then continue on my merry way without committing to or formulating The Plan. This book will not make a disaster plan for you and your family, but perhaps it will start the dialogue and provide some ideas for probable scenarios and the basic equipment for many types of emergencies from power outages to severe weather and more that we don't even want to imagine on a nice sunny day. None of us want to believe we are in jeopardy and some of the suggestions here fall outside individual boundaries, however I bet we can all imagine ourselves needing one of the 13 survival kits outlined here. The keys to your everyday survival are: situational awareness, knowledge, and practiced preparedness skills. Sure, it's important to have trustworthy survival gear, but possessing the mindset that you are prepared for anything, and that you will survive no matter what happens, is your secret weapon that will help you to stay alive in an emergency. Everyday Survival Kits contains clearly outlined packing lists for what you need for specific survival situations. 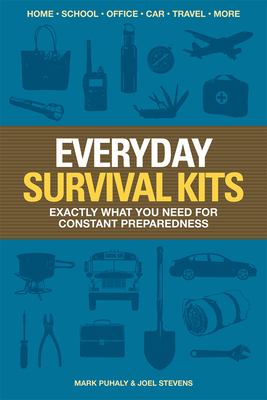 A situation will arise when you'll require more than just a bug out bag or a get home bag--with the help of this guide you'll be prepared to stay alive. The only person you can fully rely on in a survival situation is you. The more you think about possible emergencies now, and prepare for them before they happen, the more likely you are to survive. The future belongs to those who are prepared, so be ready. Mark Puhaly and Joel Stevens write for the popular survival blog survivalcache.com. Both have appeared on the National Geographic TV Show "Apocalypse 101." They have served as Marine infantry officers in the U.S. Marine Corp and Puhaly is a former Marine recon team leader and Marine officer instructor at The Basic School. Both are avid outdoorsmen and survivalists.